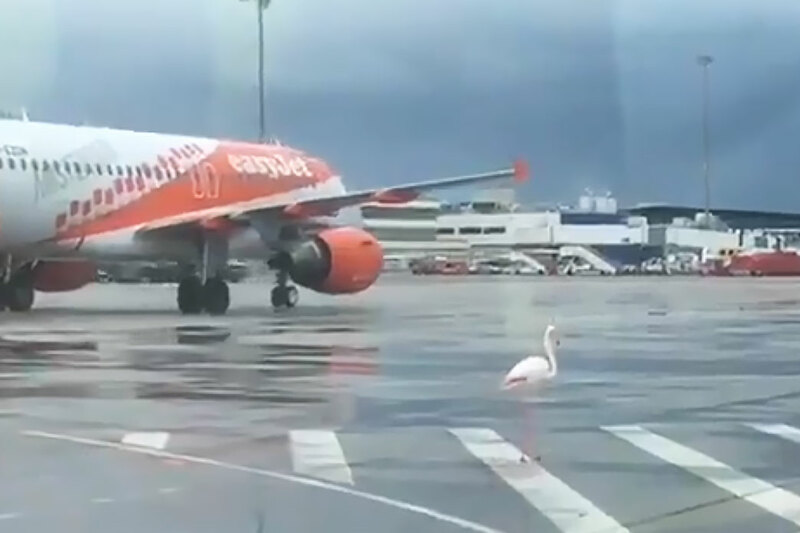 An easyJet flight was held up upon arrival at Palma, Mallorca, after a Greater Flamingo was discovered strutting around the runway. The aircraft had to slowly follow the bird which flew off, only to land again a few metres away. Eventually, however, it left for good and, according to the airport, the flamingo caused no problems or severe delays. The plane had only just arrived and was taxiing to its bay when the alert was raised about the flamingo very close by. While ground staff contacted pilots, the bird simply kept pace with the aircraft, at one stage deciding to fly off itself but then changing its mind. EasyJet spokesperson Andy Cockburn said: "At no point was any flight delayed or safety compromised in any way." One of the Palma airport workers commented: "We have a pink flamingo and, it's not a joke, it's walking around Terminal A. An EasyJet plane has had to slow down." Ground staff beeped their horns to try to dislodge the bird, to no avail. Spanish air traffic control tweeted that a flamingo had welcomed passengers into Palma, and that the bird was "very elegant, walking on the tarmac". Greater Flamingos are typically seen on the Spanish holiday island during the winter, with April a usual departure time, though normally they don't require a runway to take off. A screenshot from the video shared by Spanish air traffic control shows the flamingo strutting around on the tarmac as planes taxi past.